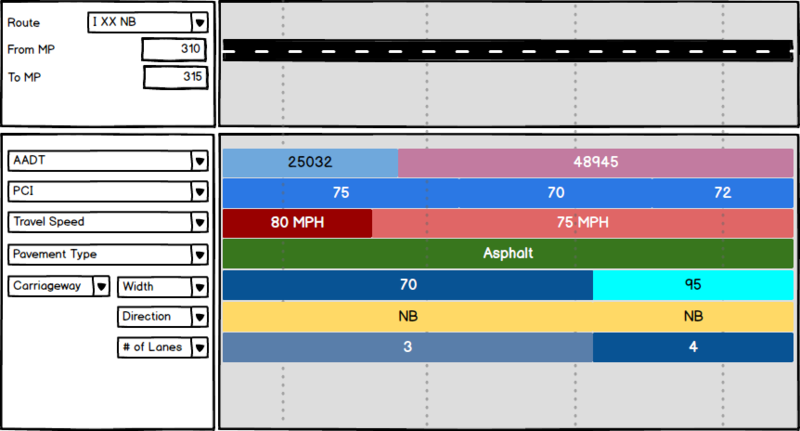 Straight Line Diagrams (SLDs), also known as Route Logs or Strip Maps, are an effective way to visualize different features and characteristics that co-exist along the same stretch of roadway. The traditional form of SLD is single-attribute and single-track; it depicts one attribute per layer in a single horizontal graphic. It assumes that there are no spatially overlapping segments in a layer. 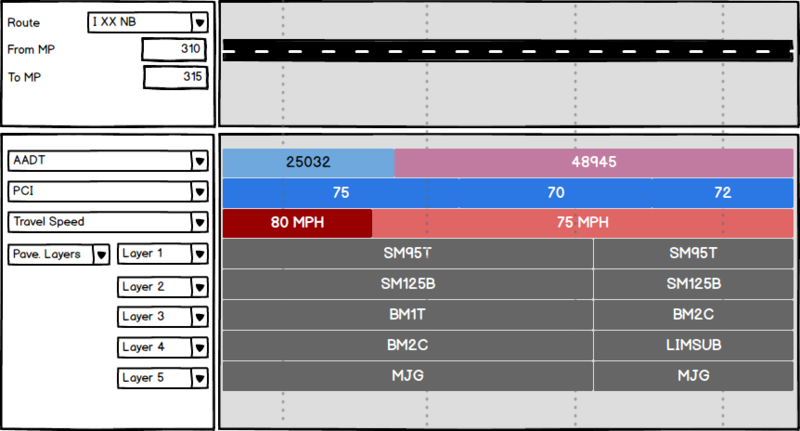 Figure 1 illustrates a traditional SLD displaying four layers: AADT, PCI, Travel Speed and Pavement Type. However, practitioners and LRS management software tools often adopt more flexible, and sometimes more efficient, LRS data modelling. 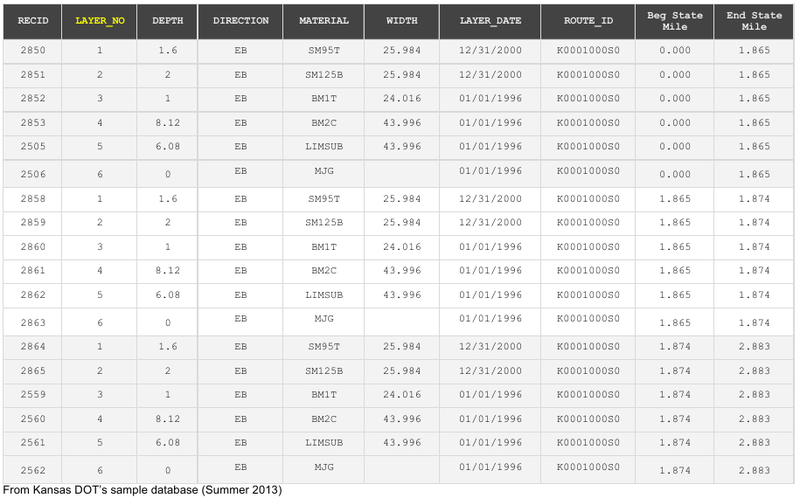 Let’s take a look at three different LRS data modelling scenarios, each requiring a different SLD for visualization. In one common scenario, layers may contain more than one attribute depicting non-spatial features. 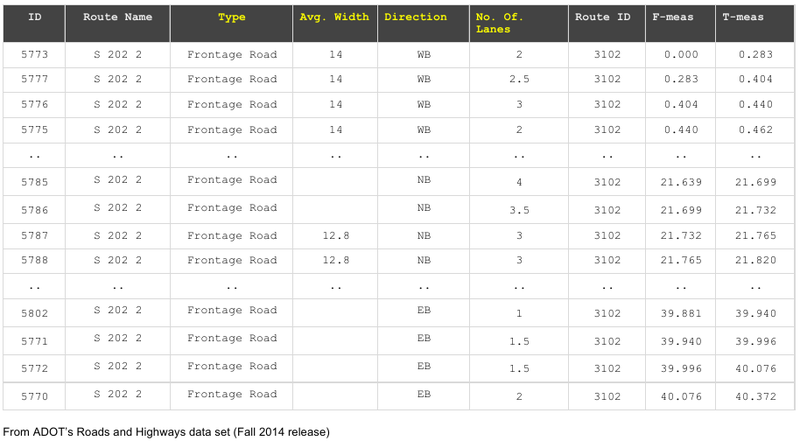 As an example, the carriageway layer data presented in Table 1 includes columns for four different, but related, attributes to describe each carriageway segment (column headings highlighted yellow): Type, Avg. Width, Direction and No. of Lanes. To effectively show layers like Carriageway on an SLD, it would be advantageous to use the multi-attribute SLD as illustrated in Figure 2. While the multi-attribute SLD addresses the single-attribute limitation of the traditional SLD, the multi-row SLD is designed to overcome the single-track constraint. Often times on a route segment, there may be events or assets that spatially overlap. 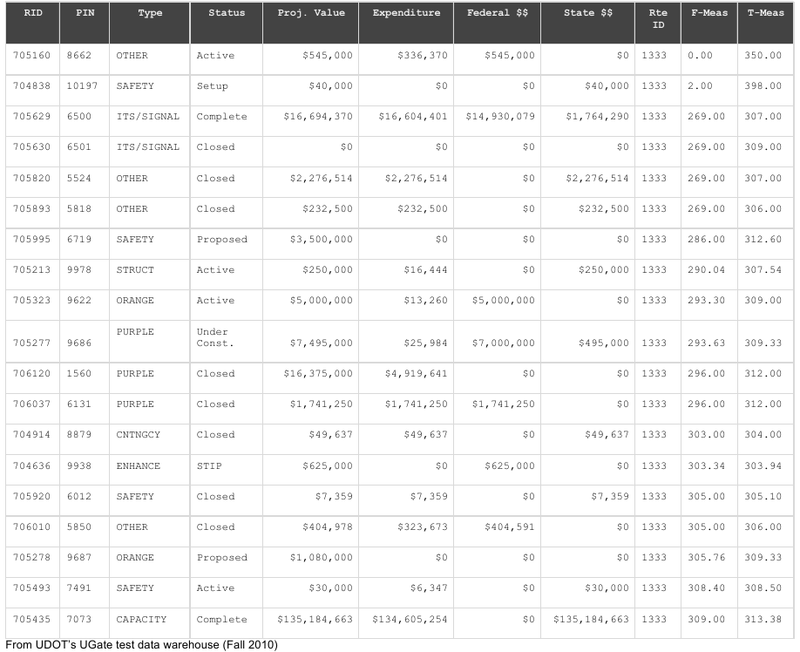 For example, Table 2 contains a list of current and completed projects located completely or partially within a 20-mile stretch of Utah’s I-15. To visualize this layer on an SLD, the multi-row SLD illustrated in Figure 3 would be a good choice. The multi-track SLD is a specific kind of multi-row SLD, in which a set of events in a layer is stratified by an attribute to denote event categories, or to denote the vertical or lateral position of events. 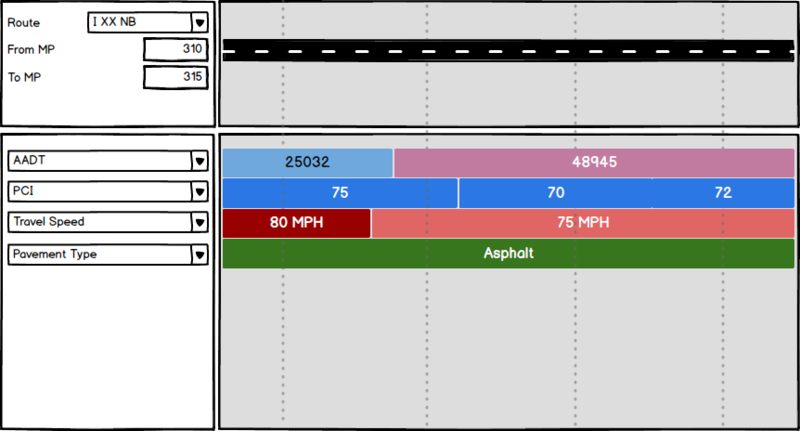 A good example of this scenario is Kansas DOT’s pavement layer data, as shown in Table 3. For the 3-mile stretch of highway K-10 EB, each row represents the pavement status (material, width & depth, etc.) of a particular layer identified by the Layer_No attribute. In the table, the “set of events” representing each highway segment is identified by the presence (or absence) of shading. The multi-track SLD would automatically render each pavement layer on its own track, as shown in Figure 4. 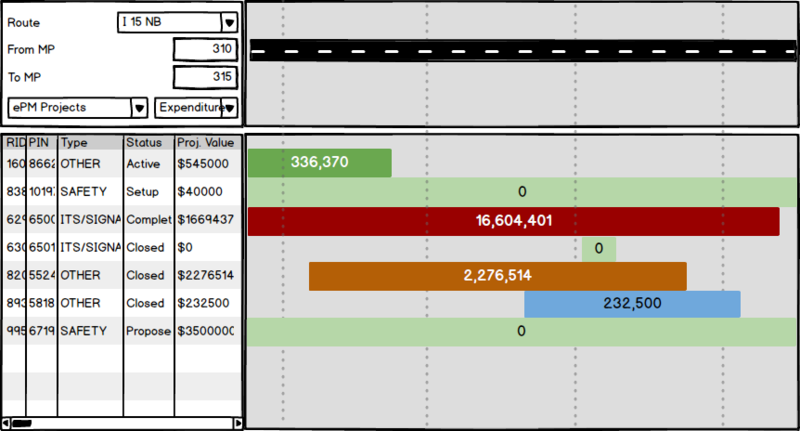 At a time when on-line, interactive LRS visualization software is replacing static SLDs, these new SLD forms can become yet another tool in overcoming the challenges of visualizing LRS data. LRS QC (Quality Control): What Are We Looking For?